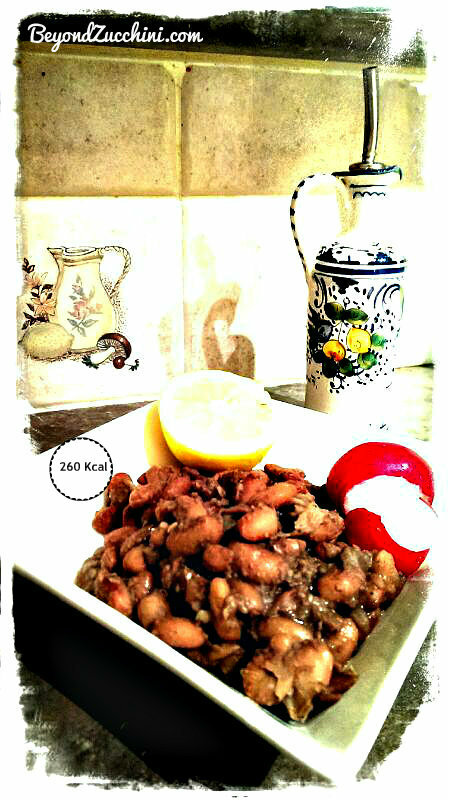 This red beans stew is a very traditional recipe. Quite popular during the winter months, this stew tends to be cooked more during the colder months rather than summers due to its warming effects and soup-like “character”, I would say. So if you’re having one of those days when you don’t feel like rolling out of bed ‘cause boy it’s freezing outside, then I would highly recommend this very simple recipe that will fill you up with a good source of protein and a great deal of warmth! Moreover, its spices will make sure to clear your nasal congestion during the winter! Why add an acid? Acidulating the water decreases its pH level, which makes it easier to break down the phytic acid. I leave it overnight, throw the water the next day, and repeat the same process one more time. Some people worry about throwing away the water because the nutrients in the beans will be lost that way. But the truth is, it is very important that you throw the soak water away because it contains all the indigestible gas-causing enzymes and trisaccharides. Plus, the soaked seaweed will provide extra minerals. This stew is particularly rich in folate, and an excellent source of other minerals such as manganese, magnesium, and phosphorus. Beans are well-known for their high content in proteins, but in order to have the complete range of amino acids in your meal, you will need to combine this bean-based dish with some whole grains. And this is actually how it is eaten, with a serving of whole-grain Arabic or pita bread. You may want to try it with a side of brown rice, too, which is just as good! Saute the onions until well browned, or carmelized. Traditionally, the recipe used much more oil, but for a healthier version that tastes just as good, use only 2 tbsp oil, adding a small amount of water from time to time (if the onions start sticking onto the bottom of the pan) until the onions are soft and brown. Add the garlic and spices, stir for a minute. Add the water and the beans, cover and cook. Cooking time actually depends on whether you are using a pressure cooker or a pot. If using a pressure cooker, pressure cook for around 2-3 minutes. If using a normal cooking pan, then it may take up to more than 2 hours. You can keep boiling the beans until the stew reaches the consistency that you like. Some prefer it soupier than others, but the majority of the people I know prefer the thicker, chunkier version. Don’t forget to squeeze a lemon wedge into your bowl for some added taste—and vitamin C of course!